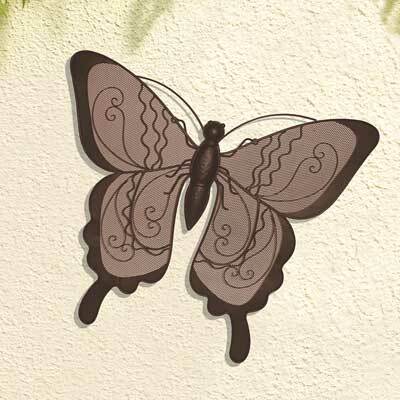 Have a butterfly in your backyard year round with the Gardman Large Butterfly Wall Art. This versatile sculpture perfectly captures the beauty of a delicate butterfly, while offering sturdiness and style to your wall. A three-segmented insect body creates the center of this unit, complete with two long antennae, six legs, and small, black orbs for raised eyes. Outstretched wings extend from either side of this central body, with a diamond-shaped lattice on each adding dimension. Curved and angled steel rods within the wings create a bold focal point, evoking the patterns found in nature. The varied brown tones enhance the natural feel, blending with virtually any setting. Keyhole openings on the back of the sculpture allow it to mount to a wall using screws (not included), and its lasting steel construction is perfect for use outside or indoors. Bring butterflies to your home or garden using this Large Butterfly Wall Art.